Finding the perfect Easter egg can be tricky and with so many to choose from, it’s no wonder. To help, we’ve pulled together some of our favourite picks from a selection of the Mell Square retailers – there’s sure to be something for you! 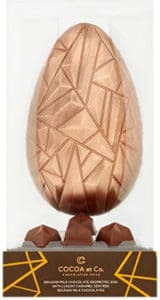 This egg has a distinctive copper-coloured geometric design and a smooth, sweet palate, with just a hint of salt to keep it from becoming too sweet. 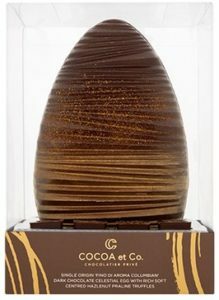 With an intricate chocolate design, the egg looks as though it’s from a traditional chocolatier. The nuts create a lovely savoury hit, perfect if you’re a fan of the classic fruit and nut combination. Alongside notes of pepper, fruit and coffee, the Sainsbury’s Cocoa et. Co egg has a creamy flavour, not to mention an eye-capturing design with hints of gold. For those who prefer a slightly bitter treat, discover Thornton’s sophisticated dark chocolate egg. 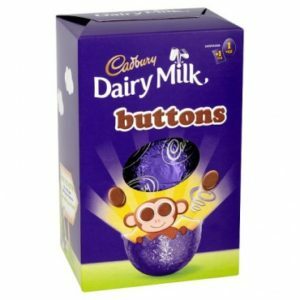 Available in Thornton’s multi-buy offer, you can get 2 for £12, 5 for £25 and 7 for £35 on selected Easter eggs. 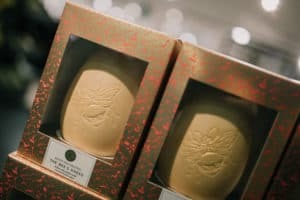 Hand-engraved with a golden bee, this Easter egg is made from an exclusive blend of Swiss chocolate and caramelised sugar – creating a rich, complex flavour and a milky caramel aroma with hints of honey. Whilst it’s not quite your traditional Easter egg, this giant hollow bunny is made from rich, creamy Swiss white chocolate with hints of vanilla. 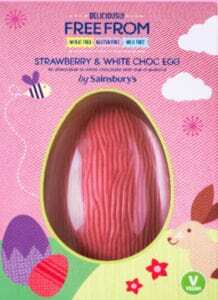 Made from a white chocolate alternative, the egg is coloured and flavoured with freeze-dried strawberries. As part of Sainsbury’s free-from range, the egg is suitable for vegans and those with gluten and wheat intolerances. 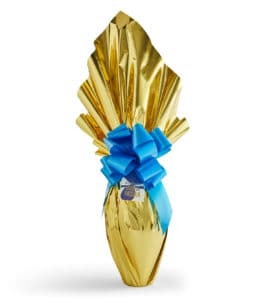 Made in Torino, this large milk chocolate egg is beautifully hand-wrapped, making for the ultimate Easter gift. 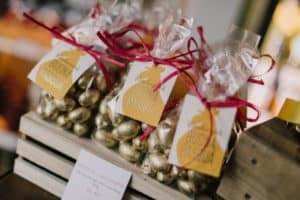 For a simple gesture this Easter, head to Carluccio’s on the High Street Available in three varieties, it’s small egg collection makes the perfect gift; Ovetti Di Cioccolato (milk chocolate with a soft cocoa filling), Ovetti Colorati (semi-hollow, dark chocolate eggs covered in a crispy sugar shell) and Ovetti Arcobaleno (white chocolate eggs decorate by hand). 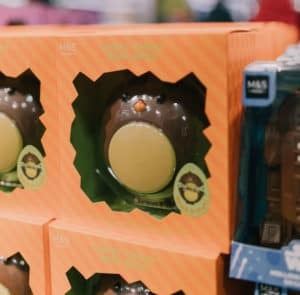 Voted the best Easter egg for children in BBC GoodFood’s 2019 guide, Marks and Spencer’s Chicky Chicky Bang Bang egg, is perfect for an Easter egg hunt prize. 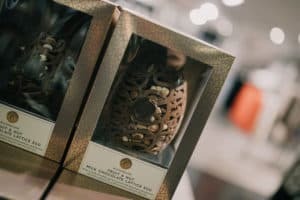 Made with high-quality chocolate, the playful child-friendly design comes with instructions to ‘smash and share’ to reveal the mini speckled chocolate eggs within. 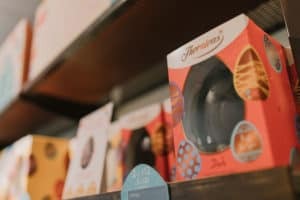 With almost 100 years’ experience in Easter egg making, there’s no surprise that Thornton’s is one of our top picks. Whether you prefer milk, white or dark chocolate, you’re sure to find an egg to suit your loved ones. Looking for something more memorable? Why not personalise the egg with a hand-iced name or message – perfect for showing them how much you care. 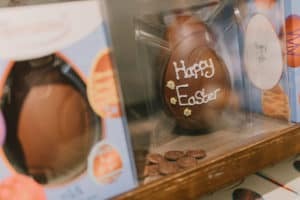 For a small Easter treat, Poundland has a great range of eggs for £1 each, including household favourites, Cadbury and Milkybar. What are you waiting for? Head to Mell Square and find your perfect egg to avoid missing out. Keep up-to-date with the latest news and offers by searching ‘Mell Square’ on Facebook, Instagram and Twitter.